I just looked at the calendar today and realized the July 4th holiday was a week away. Eek, where does the time go? But, the occasion also means another gathering of the Holiday Food Party Bloggers, creating some tasty, picnic themed recipes to celebrate. I first saw this recipe on Brown Eyed Baker and immediately pinned it. I didn't know when I'd get to it but I knew for sure that I would. Then a few weeks ago, when I started thinking about my summer holiday desserts, I decided that one would be perfect. The original recipe only included strawberries but I added blueberries, too, because I love the two fruits together and both go so well with cheesecake. I first tried out the recipe on Mother's Day and brought it to Brian's mother's house. I told everyone that this was a recipe test and that I wanted their full and honest feedback and they all certainly took their jobs seriously. They studied every nuance of this pie as they ate it. They examined every layer like the judging panel of the Pillsbury Bake Off. Most of them announced that they needed a second helping in order to properly evaluate. There was much discussion about the cookie base that was in the original recipe and, ultimately, they concluded that they enjoyed eating it on its own but, as a whole, the cream cheese layer was getting lost. Hmm. I can fix that. So, over the Memorial Day weekend, I remade the dessert with a pie base instead of a cookie base and everyone agreed they preferred it. Of course, considering how the first pie was ravaged, they obviously didn't object much to that version either! Whichever base you use, this dessert is a winner and I'll be making a lot more of it. Enjoy! Make the pastry dough by adding the flour, baking powder and salt to the bowl of a food processor. Add the chilled butter and pulse until the mixture resembles course crumbs. With the machine running, slowly pour the ice water through the feed tube until a dough ball forms. Pat the dough out on a lightly floured surface, wrap in plastic and refrigerate for at least an hour. Roll out the dough on a floured surface until it is about 10" around and lay it into a 9" tart shell, preferably one with a removable bottom. Line the tart shell with parchment paper, fill it with pie weights and bake in a pre-heated 350 degree oven for 30 minutes. Remove the pie weights and return the tart shell to the oven for an additional 10 minutes or until it is a light golden brown. 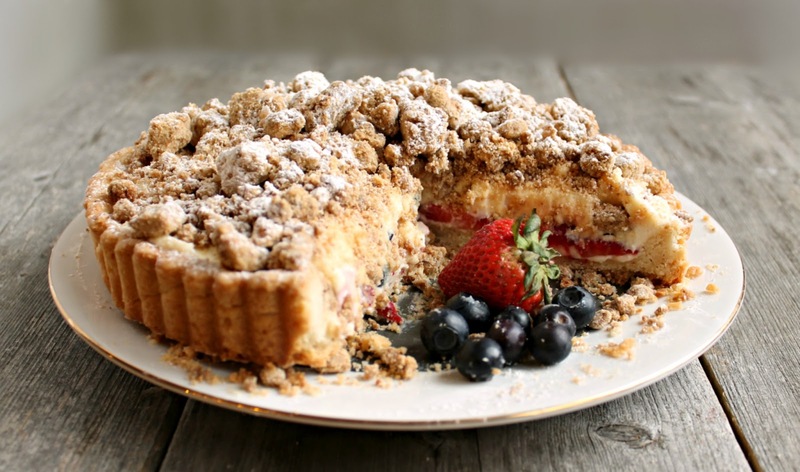 Make the crumb topping by combing the flour, sugar, baking powder and salt in a bowl. Pour in the melted butter, mix and allow to stand for 5 minutes. With your hands, crumble the mixture onto a baking tray lined with parchment paper and bake in a pre-heated 350 degree oven for 20 minutes. Toss the crumbs around, making sure none are burning, and return to the oven for an additional 10 minutes or until they are lightly golden brown. Set aside to cool. Make the cheese mixture by beating together the cream cheese, sugar and vanilla until smooth. 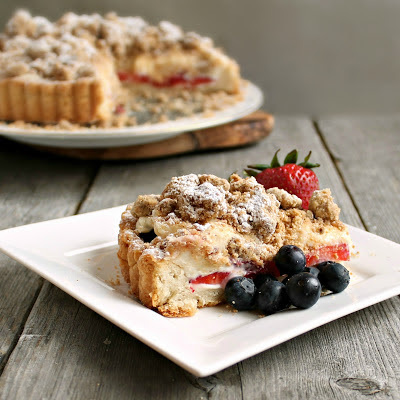 When the tart shell has cooled, pour half the cream cheese batter into it, layer on the strawberries and blueberries and top with the remaining cream cheese batter. 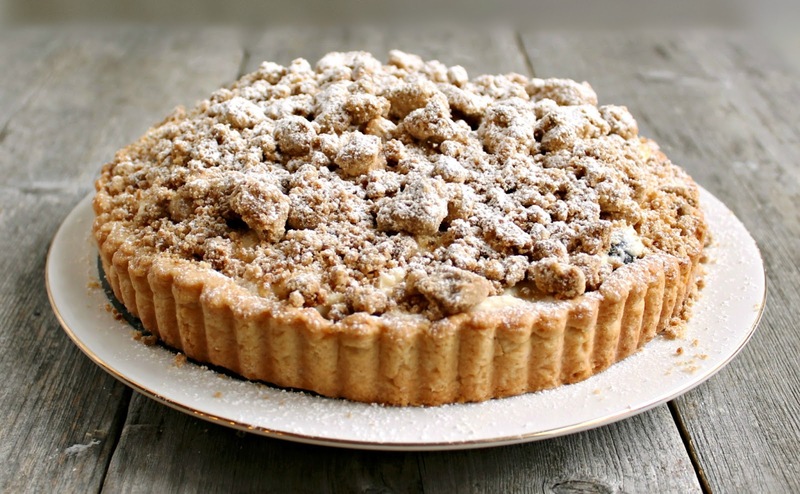 Top the pie with the baked crumbs and sprinkle with powdered sugar, if desired. Makes about 8 servings. Be sure to check out all the other July 4th deliciousness our group has put together. Did you say cheesecake? Crumbs? Berries? Yup, LOVE this!!! I have been in love with this tart since the first day I spotted it on Facebook. It has everything! Girl, you are all kinds of genius. I may need a 2nd helping to determine that, though. What would we do without our family and friends to help us with refining our recipes? I think the pie crust would be better for this tart and an excellent decision on your part. You had me at cheesecake. Love this! I have been drooling over this since you posted the sneak peek in the group on FB. Looks so so good!! Oh, I just love crumb topping and well cheesecake of course. This looks fantastic! You know I love your crumb toppings! Everything sounds spectacular about this tart. Only wish I could have been there during the taste tests. SOOOOOO much about this sweet treat that I love. Berries. Cheesecake. Crumb toppings! Yum, yum! Oh my goodness this is just gorgeous! I love everything about this recipe... perfection! Anita, your tart looks stunning! Wishing you a delicious and festive 4th! All my favorites in one dessert! It look amazing, Anita! I love the photos! This looks amazingly good. This along with the S'more-tini and I would be a happy camper. A couple of pounds heavier but happier nonetheless! sounds yummy! i love berries! Strawberries and blueberries together with cream cheese - oh yes! OMG! This sounds delicious and perfect for (gasp) the upcoming (fast approaching) Fourth! I know what you mean - I thought the summer solstice was just yesterday. :) What a perfect dessert for the 4th or for any time! What??? 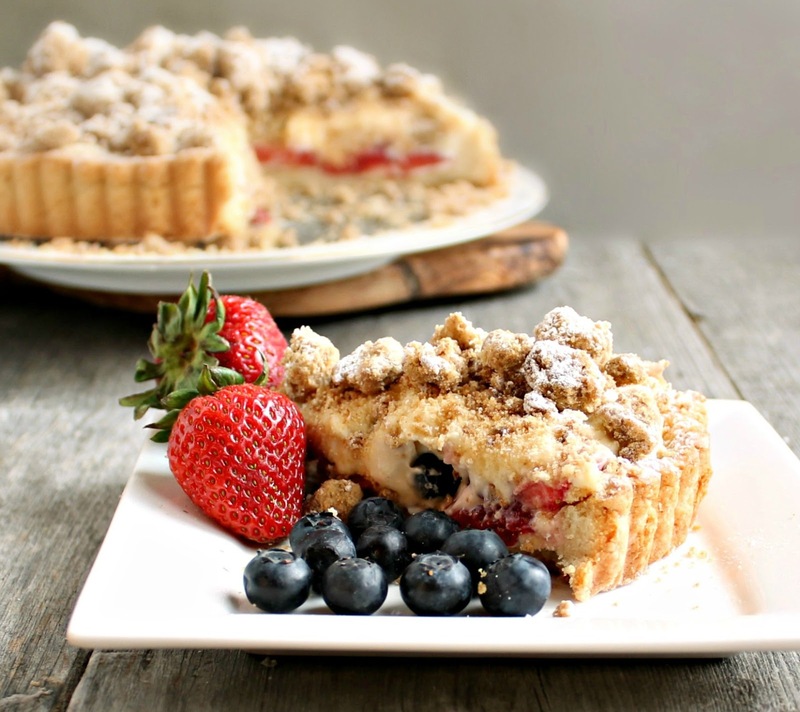 Cheesecake, crumb topping, and a crust?!?! Mind blown. This looks awesome!!! I love that you have people who give great feedback on recipes. I swear with my family so spread out now I may need to hire some neighbours to start taste testing some experiments. I love this recipe. Brown Eyed Baker makes such cool stuff. I bookmark lots of her recipes. I love that you tried it with different bases. I'd likely prefer the pie myself. Just knowing how I am about that stuff. oh my gosh, it's like a crisp and a cheesecake had a baby! Looks wonderful! Amazing! I love summer berries in anything! This looks so phenomenal, I can't get over it! I stumbled on your blog via Daily Buzz Food and I immediately bookmarked this. Can't wait to try it! I also wanted to let you know that I loved this recipe so much that I included it in my Weekend Wrap-Up blog post, where I feature some of my favorite web finds from the past week. Thank you for such a great post, and enjoy the rest of your weekend! I love cheesecake and I love crumb cake AND I love blueberries. All my favorites in one dessert. Thank you for linking up with Foodie Friends Friday! I chose this recipe as my Host Favorite and it will be featured tomorrow on Daily Dish Magazine! What a beautiful creation. 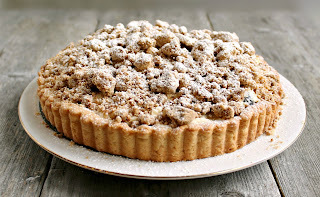 I love anything with crumble on top!